The Azure CLI is used to create and manage Azure resources from the command line or in scripts. This guide details using the Azure CLI to deploy a Kubernetes cluster in Azure Container Service. Once the cluster is deployed, you connect to it with the Kubernetes kubectl command-line tool, and you deploy your first Windows container. Support for Windows containers on Kubernetes in Azure Container Service is in preview. Create a Kubernetes cluster in Azure Container Service with the az acs create command. The following example creates a cluster named myK8sCluster with one Linux master node and two Windows agent nodes. This example creates SSH keys needed to connect to the Linux master. This example uses azureuser for an administrative user name and myPassword12 as the password on the Windows nodes. Update these values to something appropriate to your environment. After several minutes, the command completes, and shows you information about your deployment. To connect to the Kubernetes cluster from your client computer, use kubectl, the Kubernetes command-line client. The following Azure CLI example installs kubectl to your system. On Windows, run this command as an administrator. To configure kubectl to connect to your Kubernetes cluster, run the az acs kubernetes get-credentials command. The following example downloads the cluster configuration for your Kubernetes cluster. kubectl lists the master and agent nodes. You can run a Docker container inside a Kubernetes pod, which contains one or more containers. This basic example uses a JSON file to specify a Microsoft Internet Information Server (IIS) container, and then creates the pod using the kubctl apply command. Create a local file named iis.json and copy the following text. 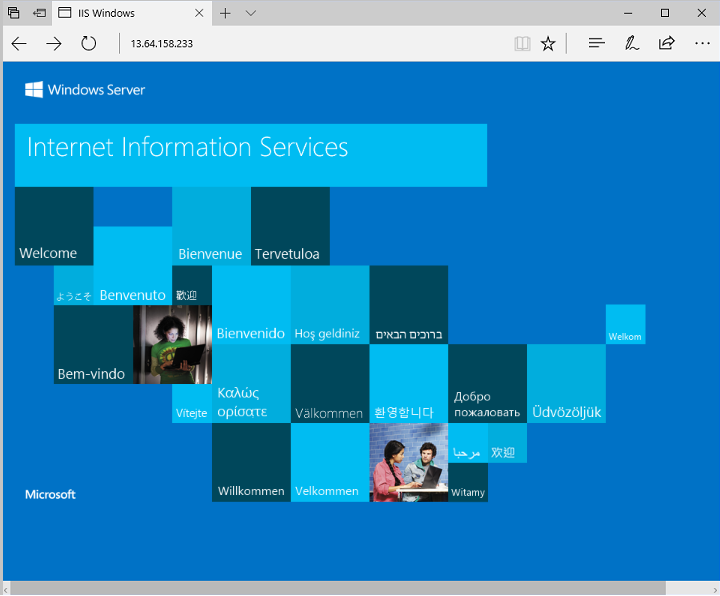 This file tells Kubernetes to run IIS on Windows Server 2016 Nano Server, using a public container image from Docker Hub. The container uses port 80, but initially is only accessible within the cluster network. While the pod is deploying, the status is ContainerCreating. It can take a few minutes for the container to enter the Running state. With this command, Kubernetes creates a service and an Azure load balancer rule with a public IP address for the service. Run the following command to see the status of the service. In this quick start, you deployed a Kubernetes cluster, connected with kubectl, and deployed a pod with an IIS container. To learn more about Azure Container Service, continue to the Kubernetes tutorial.